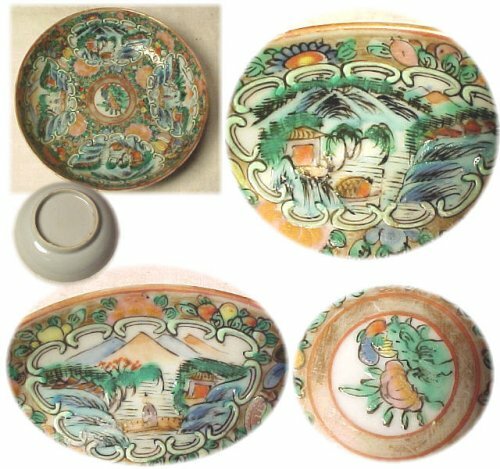 I am a collector of Chinese Export Rose Medallion porcelain. I am familiar with most patterns but have come across one that i have not seen before. The pieces I have are small bowls 4 inches in diameter and 1 inch deep. they have the characteristic center medallion and 4 panels, but the panels present landscape scenes with mountains in the bachground. The bowls are not marked. The porcelain looks the same in texture as most of the pieces I have that date to the late 19th century. I am wondering whether these are authentic or a modern reproduction. I have attached a picture that I hope will help you identify the pattern. Thanks so much for your wonderful site, it has helped me tremendously in identifying pieces in my collection. Your dish is authentic and dates to around 1875. If you have access to Dr. John Quentin Feller's "The Canton Famille Rose Porcelains from the Alma Cleveland Porter Collection in the Peabody Museum of Salem" you might want to compare with fig 32 on page 26, where a similar Rose Medallion Leaf dish is illustrated. It has got only two landscape panels though, but displays great similarity in the general design why I feel we can consider your small dishes as perfectly contemporary.